Kilchberg, 6 March 2018 – Lindt & Sprüngli once again achieved to grow at a faster pace than the overall chocolate market in 2017, despite challenging conditions. For the first time in its history of almost 175 years, the Group achieved sales worth more than CHF 4 billion, amounting to a +4.8% increase in Swiss francs. The organic sales growth of Lindt & Sprüngli was with +3.7% below the range of the long-term strategic growth target due to the modest development of the US companies. The Group’s operating profit (EBIT) rose by +5.8%. Thanks to increased operating efficiency, the EBIT margin also improved from 14.4% to 14.6%. Net profit was up +7.8%, with return on sales reaching 11.1%. Organic growth in the EUROPE segment amounted to +6.2%. Lindt & Sprüngli performed particularly well in the two biggest chocolate markets of Germany and the UK, as well as in the mature markets of Italy, Austria and Spain, but also achieved double-digit growth rates in less established markets such as “Nordics", Russia, Poland and the Czech Republic. Sales in the NAFTA region dipped slightly in a difficult retail environment by -1.6%. One particular highlight is the excellent result reported by Lindt Canada, which achieved double-digit growth. The American companies Lindt and Ghirardelli also recorded modest growth in a rapidly changing retail environment, due to the repositioning of the drugstore channel (an important outlet for chocolate) and department stores struggling with a decline in customer traffic. Russell Stover faced a decline in sales caused by the combination of a weaker market in general, the difficulties experienced by individual retail partners, and the realignment of its product portfolio. These adjustments included the successful relaunch of the sugar-free chocolate line based on stevia extract in the second half of the year, while new packaging and additional attractive price points helped deliver buoyant sales during the Christmas period. With the three brands Lindt, Ghirardelli and Russell Stover, the Group is No.1 in the premium segment and No. 3 in the U.S. chocolate market as a whole. With the ongoing strategic realignment of Russell Stover and the scheduled activities for Lindt and Ghirardelli, Lindt & Sprüngli remains on track in the world’s largest chocolate market and during the last financial year has built the foundation for further profitable growth. The REST OF THE WORLD segment is becoming increasingly important for the Lindt & Sprüngli Group. Business in the countries of this region is performing better than average, with organic growth of +12.4%. Markets such as Brazil, South Africa, Japan, China and Russia hold enormous potential for Lindt & Sprüngli in the coming years. Growth strategies in these markets are based on local consumer preferences. More information on this special topic can be found in the Annual Report 2017 https://report.lindt-spruengli.com/17/ar/en/ . “In addition to the more mature chocolate markets, it is increasingly the new growth markets such as Brazil, China, Japan, Russia and South Africa that are driving our dynamic performance.” Dieter Weisskopf, Group CEO. Global Retail is making a key contribution to the overall Group result with its own shops and Chocolate Cafés. An important milestone was reached in 2017, when sales reached half a billion Swiss francs for the first time. Over 50 new retail outlets at prime locations have extended the network to more than 410 sites worldwide. In 2018, over CHF 30 million will be invested in the expansion and modernization of the Lindt Cocoa Center in Olten. There cocoa mass is produced to supply the European manufacturing companies. The additional capacity due to come on stream in the spring of 2019 will support the future growth of the entire Lindt & Sprüngli Group. Construction work on the new Chocolate Competence Center started beginning of 2017. This project is financed and managed by the charitable Lindt Chocolate Competence Foundation. The Center is intended to strengthen Switzerland’s international standing as a center of excellence in chocolate-making and will also foster the pooling of chocolate expertise across the entire industry. The Center will open its doors in 2020 to mark the 175th anniversary of Lindt & Sprüngli. Lindt & Sprüngli confirms its mid- to long-term target of organic growth in the region of 6 to 8% and the improvement of its operating margin by 20-40 basis points. Given the ongoing strategic realignment of Russell Stover’s product portfolio and the current challenges in the U.S. retail market, the Group expects organic growth of around 5% in the financial year 2018, as well as an increase in the operating profit margin within the long-term strategic range. Given the Group’s high liquidity, solid balance sheet and consistently high cash flow, the Board of Chocoladefabriken Lindt & Sprüngli AG has decided to launch a buyback program worth up to CHF 500 million for registered shares and participation certificates. This program is expected to start on March 12, 2018 and will end no later than July 31, 2019. A separate trading line will be opened for registered shares and participation certificates on the SIX Swiss Exchange in accordance with International Reporting Standards. In view of the strong result achieved in the past financial year, the Board of Directors will be proposing to the 120th General Meeting a 5.7% increase in the dividend. This is equivalent to CHF 930.- per registered share (CHF 420.- from the approved capital contribution reserve (agio) free of withholding tax and CHF 510.- from available retained earnings) and CHF 93.- per participation certificate (CHF 42.- from the approved capital contribution reserve (agio) free of withholding tax and CHF 51.- from available retained earnings). Next publication: Semi-annual results 2018, on Tuesday, July 24, 7.00 a.m.
As global leader in the premium chocolate sector, Lindt & Sprüngli looks back on a long standing tradition of almost 175 years which takes its origins in Zurich, Switzerland. Today, quality chocolate prod-ucts by Lindt & Sprüngli are made at 12 own production sites in Europe and the USA. They are distributed by 25 subsidiary companies and branch offices, in more than 410 own stores, and also via a comprehensive network of more than 100 independent distributors around the globe. 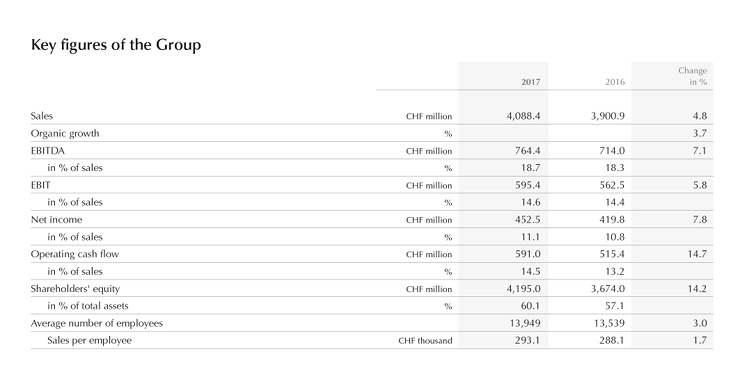 With over 14,000 em-ployees, the Lindt & Sprüngli Group reported sales worth CHF 4.1 billion in 2017.